If you’ve never cared for an elderly loved one, you might think that anyone can provide home care services. But if you’ve provided care for a parent or grandparent, you know that high-quality care takes a unique mix of skill, patience, and experience. It’s an important point for anyone hiring home care services: high-quality senior home care means experienced senior home care. To most people, that means hiring a caregiver with a proven background in senior services. While important, this isn’t the only thing you should look for in experienced senior home care. It’s just as important that you’re choosing a qualified, well-respected agency. If the agency is a part of a larger network, you’ll also want to consider their experience as an organization. America’s most trusted caregiving companies are well-established names with proven track records. Usually, the easiest way to find experienced senior home care is to look for companies with a history of high-quality care. The best home care companies earn their reputations by sharing resources, knowledge, and experience at every level of their organization. They also set and enforce rigorous caregiving standards, giving clients and their families total piece of mind. This is a big reason why so many families choose Visiting Angels for experienced senior home care. As a company, we have more than 20 years of caregiving experience. Over the years, we’ve created a rigorous support network for our local offices, allowing us to share our experience and expertise. We provide every office with systems, tools, and educational resources they need to deliver truly exceptional care. If you’re hiring a caregiver through a local agency, you should evaluate the agency closely. How long have they been in business? What are their relationships with clients like? Which systems and standards do they use to ensure high-quality care? An experienced senior care agency will have rigorous staffing and screening standards, reducing the risk that you’ll be assigned an unqualified or untrustworthy caregiver. They will also have systems in place to measure and monitor caregiver performance. At the same time, a great agency can help you make sure that your loved one receives the right kind of care. Every senior who receives home care has unique, individual needs. If care services aren’t properly tailored to these needs, their quality of life can suffer. An experienced senior home care agency will customize care to your loved one’s needs. They will also help you plan care around your loved one’s schedule and your family’s financial situation. Knowledgeable senior home care depends on knowledgeable care providers. Prior caregiving experience makes it easier for caregivers to juggle various care tasks, attend to seniors’ physical and emotional needs, recognize early signs of age-related decline, and build a rapport with their clients. At Visiting Angels, we place tremendous value on caregiver knowledge. We’ve developed rigorous recruitment guidelines to help our local offices find the most qualified, most knowledgeable, and most trustworthy caregivers possible. 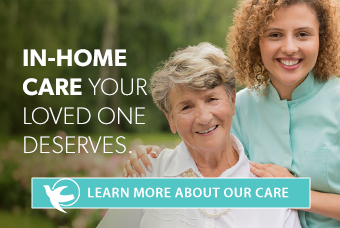 To ensure you find the right fit, we also allow you to Select Your Caregiver®. This way, you can be sure that your loved one is matched with a care provider who can meet their needs and who will have a complimentary personality. Looking for experienced senior home care in your community? Contact Visiting Angels today to connect with your local office and request a free consultation.